"Get to Know Her and Her Family"
This month Visiting Teaching Principle is all about getting to know the sisters you visit and arranging your visits for their specific needs. Something that I always find very helpful is to keep the list of the sisters I visit next to my bed, so as I kneel to pray, I will remember them in my prayers. Ask Heavenly Father for help in knowing and understanding the needs of your sisters. The printable this month is for YOU! 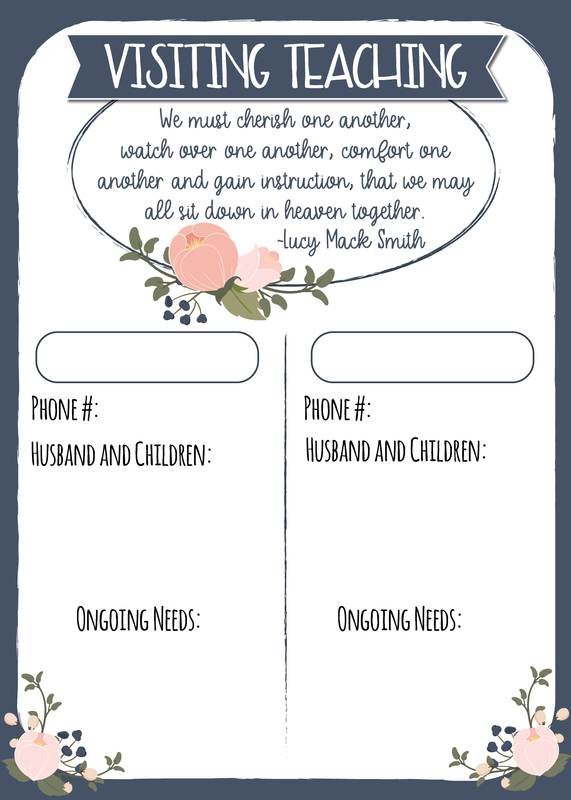 Print one off and fill it in with the name of the sisters you visit, their phone numbers, husband and children's names, and any ongoing needs that you could help them with and/or pray about for them. You can give one to your partner, also! You can use the back of the card to write down more thoughts/dates/needs as they come up over the course of time. Keep this card handy - by your bedside, in your scriptures, on your fridge - so that you can be reminded daily of your sisters. Keeping them on your mind will help you get to know her and her family better. The download has two cards on an 8.5"x11" page. If you visit more than two sisters, make multiple copies or print front to back! Click here if you'd like a JPG of this card. It is 5"x7"
I love the quote that's in the lesson by Lucy Mack Smith! This will make a beautiful addition to your Relief Society bulletin board!